Straight Talk is the real deal: fantastic coverage, blazing fast 3G speeds and no monthly contract. Since I’m so excited, we’re going to front load this review: if you don’t want to sign a contract to have an iPhone, Straight Talk is the best prepaid carrier you can possibly choose in the United States. And even if you have no problem with signing a two year contract with one of the big three, you should seriously consider Straight Talk: you get the same quality of coverage and network speeds as if you signed up with AT&T for hundreds of dollars less. Got that? Now let me elaborate. Why Does America Hate Prepaid Carriers? Before I moved back to America last year, I’d spent the previous decade living in Europe, and the only mobile phones I’d ever had were European. Most of those phones, in turn, were prepaid, pay-as-you-go phones, and I was always very happy with them. Instead of having to sign away my soul for years at a time to a carrier for a monthly allotment of minutes and texts that I would probably never exhaust, I could walk into a shop with my existing phone and walk out with a plan where I only paid for what I used. And because, in Europe, you never paid for phone calls or text messages you received, twenty euros worth of credit could last me half a year at a time. A law-abiding citizen, it is inferred, would prefer to sign up for an expensive two-year contract on an allotment of minutes and texts that they may very well never use than opt for the same cellphone plan favored by Marlo Stanfield on The Wire. So back when I lived abroad, America’s attitude towards prepaid phones completely mystified me. Part of that attitude has always seemed to me to be simply classist: look at the way, for example, Hollywood treats prepaid “burners” as being essentially synonymous with drug dealers and criminals. A law-abiding citizen, it is inferred, would prefer to sign up for an expensive two-year contract on an allotment of minutes and texts that they may very well never use than opt for the same cellphone plan favored by Marlo Stanfield on The Wire. That’s just stupid: there are way more reasons why the average person might not want to sign up for a two-year mobile contract than the other way around. Unlimited data. Unlimited texts. Unlimied minutes. Monthly fees that are only half what the likes of AT&T and Verizon charge. The ability to walk away at any time if you find a better provider. In fact, I’d argue there are only two real reasons why a person would sign a contract with a major carrier. The first has to deal with network coverage; the second, to get themselves the latest and greatest smartphone. Luckily, times are changing. Prepaid carriers are getting a lot better about offering an attractive range of modern smartphones with their services, and over the last few months, we’ve seen the iPhone 4S finally hit the prepaid market through at least three different prepaid carriers. I’m a big proponent of buying the iPhone 4S and going prepaid. Even having to pay for an unlocked iPhone upfront, you can save over a thousand dollars over the course of two years by signing up with Virgin Mobile instead of AT&T or Verizon. That’s real money for anyone. Unfortunately, the truth of the matter is that most prepaid carriers have slightly worse service coverage than the big boys. And worse, 3G data on prepaid carriers like Virgin tends to be bog slow compared to the speeds you’ll get on AT&T and Verizon. Over the last month, though, I’ve been testing the iPhone 4S with Straight Talk, Walmart’s pre-paid offering. And after a month of testing, I can conclusively state that if you want a prepaid iPhone, Straight Talk is probably the best carrier you can possibly choose. Not only will you save more money on Straight Talk than on the likes of Virgin Mobile or Cricket, but you’ll get blazing fast HSPA+ data to boot. 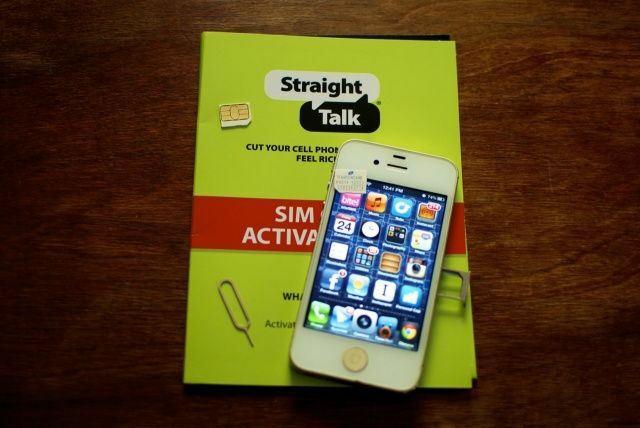 If you want a prepaid iPhone, Straight Talk is probably the best carrier you can possibly choose. Here’s how it works. The first way Straight Talk differentiates itself from the likes of Virgin Mobile or Cricket is you don’t have to buy your iPhone through them. That means that you have a lot more options: Virgin Mobile and Cricket will only sell you an 8 GB iPhone 4 or a 16 GB iPhone 4S in black or white. Using Straight Talk, though, you can use any GSM iPhone, from an old unlocked iPhone cluttering around a door to a fully unlocked 64GB iPhone 4S you bought straight from Apple.com. You can even use an AT&T iPhone that is still carrier-locked. The reason Straight Talk can manage that last impressive feat is because Straight Talk piggybacks off of AT&T’s GSM network. That brings another major advantage to going with Straight Talk over the likes of Virgin Mobile or Cricket: if you’re using an iPhone 4S, you get full HSPA+ “4G” speeds. That means that using an iPhone 4S on Straight Talk is every bit as fast when it comes to data as using an iPhone 4S you got directly from AT&T. Considering that AT&T currently has the fastest iPhone network in the land, at least until the LTE iPhone comes out, that’s an advantage that simply can’t be over-stated: an iPhone 4S running on Straight Talk’s network will be faster than a Verizon iPhone or Sprint iPhone. Set-up isn’t difficult, although it’s not as straight forward as it is for many carriers. You plug in your SIM card and then set up your iPhone as normal. Once the set-up is complete, you need to visit a website over WiFi to set up the 3G connection. It’s not hard, but not exactly plug-and-play either, and you need to make sure to follow the instructions precisely. Once everything is up and running, Straight Talk just screams, though. In our experience, the voice quality, 3G speeds and network coverage were just as good as AT&T’s: we were even able to extensively use Straight Talk’s network in the middle of nowhere on a weekend camping trip. Everything else works without a hitch, including features like iMessage. There are only two drawbacks. The first is you’ll lose Visual Voicemail. That’s a shame, as it’s a killer feature on the iPhone, but it’s hardly a deal breaker. More confusingly, Straight Talk doesn’t support the sending or receipt of MMS messages. If you use iMessage a lot, this isn’t a big problem, but if you regularly send pictures to friends without iPhones (or get MMS messages from friends without iPhones), the lack of MMS can be confusing, because there are no error messages when you try to send or receive one: instead, MMSes just disappear into the ether. We’re going to be blunt: right now, if you want an iPhone and can afford to pay more upfront to have more freedom and pay less down the line, Straight Talk should be at the top of your list of carriers. You get all the benefits of AT&T’s HSPA+ and GSM networks for half the price, only sacrificing Visual Voicemail and MMS messaging in the process. And the savings you’ll get for giving up these small features is huge. If you want an iPhone and can afford to pay more upfront to have more freedom and pay less down the line, Straight Talk should be at the top of your list of carriers. Let’s put it in perspective. Right now, if you signed up for a 64GB iPhone 4S on AT&T’s network, the best deal you could possibly get is $85.00 a month for unlimited minutes and messaging and 1GB of data. That’s after paying $399 for the subsidized iPhone. Over two years, that plan would cost you $2,439.00. On Straight Talk? Even after paying $849 for an unlocked 64GB iPhone 4S, you’ll only spend $1929.00. That’s a savings of over $500 over two years, and you get unlimited data on top of it. Is Visual Voicemail and MMS worth $500 and a much more meager data allowance to you? The equation may very well change once the next iPhone with LTE is unveiled next month, but for right now, we have no reservations in recommending Straight Talk as the absolute best value in iPhone plans right now. If you can afford to pay more for your iPhone up front, Straight Talk is the carrier you should be considering above all others: you get all the benefits of AT&T’s network without selling your soul or emptying your wallet out to them.